David is five feet ten inches tall and has blue eyes. When David was 15 he was punched in the face, by George Underwood. The result of this punch was permanent damage to his left eye. The pupil in his left eye is permanently dilated, which gives him the appearance of having two different colored eyes. This injury affects both his depth perception and his ability to see colors. 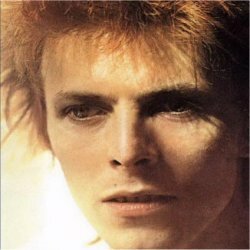 Bowie, throughout his career has taken on many different personas and images. One of his most famous personas is that of Ziggy Stardust. Ziggy’s wild costumes were designed by Kansai Yamamoto. David has a star on the Hollywood Walk of Fame. David Bowie played the Role of Pontius Pilot in Martin Scorese’s Last Temptation of Christ. The movie was released in 1988. David Bowie was unable to attend the recording session of Band Aid. His potion was recorded and then dubbed onto the final track. David sang his lines in person on stage at the Live Aid concert. He also made a contribution to the album which is on the B side. David Bowie played the role of Jareth, the Goblin King in Jim Hensen’s movie, Labyrinth. David starred with Jennifer Connelly and a host of Muppets in this classic. Bowie not only acted in this movie but sang and danced. He wrote, produced and performed many of the songs in this science/fantasy film. Among some of his more colorful quotes are “Freud would have a heyday with me” and “I’m not comfortable with the mainstream thing”. Bowie has publicly admitted to being bi-sexual. David has been married twice. His first wife was Angela Barnett. They were married on March 19th 1970. The couple had one child, Duncan Zowie Haywood Jones before they divorced in 1980. David married his current wife Iman Abdulmajid in 1992. They have one daughter, Alexandria Zahra Jones who was born in the year 2000. David Bowie’s hit song Fame was written with John Lennon and Carlos Alomar. In 2006 Bowie was awarded the Lifetime Achievement Award at the Grammy Awards. He also won the Best Male Solo Artist in 1984 at the Brit Awards. This entry was posted in Movie & Entertainment, Music Trivia, People Trivia and tagged David Bowie, David Bowie Bio, David Bowie Bio Trivia, David Bowie Trivia by Jane. Bookmark the permalink.